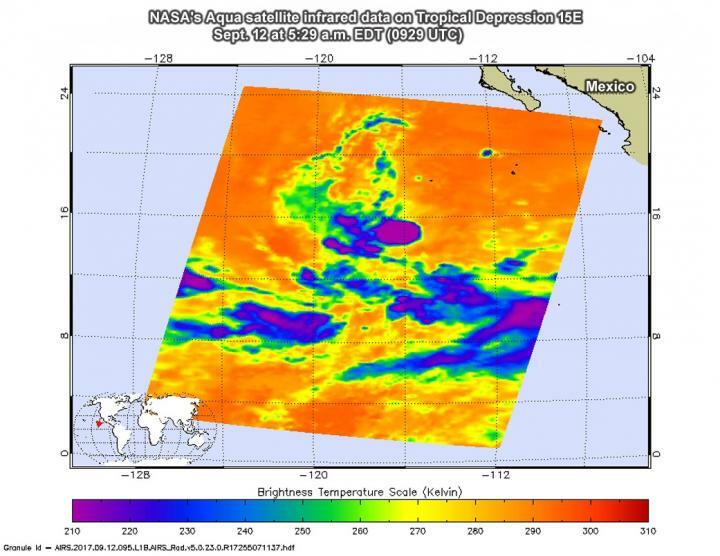 NASA's Aqua satellite measured cloud top temperatures in newly formed Tropical Depression 15E in the Eastern Pacific Ocean and found some strong storms. Tropical Depression 15E developed around 5 p.m. EDT on Sept. 11 and is not a threat to land areas. The Atmospheric Infrared Sounder or AIRS instrument aboard NASA's Aqua satellite analyzed Tropical Depression 15E (15E) in infrared light. Infrared light provides scientists with temperature data and that's important when trying to understand how strong storms can be. The higher the cloud tops, the colder and the stronger they are. So infrared light as that gathered by the AIRS instrument can identify the strongest sides of a tropical cyclone. When NASA's Aqua satellite flew over 15E on Sept. 12 at 5:29 a.m. EDT (0929 UTC) AIRS detected strong thunderstorms around the center and southwest of the center. Cloud top temperatures in those three areas were as cold as minus 63 degrees Fahrenheit (minus 53 degrees Celsius). Storms with cloud top temperatures that cold have the capability to produce heavy rainfall. At 11 a.m. EDT (8 a.m. PDT/1500 UTC), the center of Tropical Depression Fifteen-E was located near 15.6 degrees north latitude and 116.2 degrees west longitude. That's about 650 miles (1,045 km) southwest of Cabo San Lucas, Mexico. The depression is moving toward the west near 15 mph (24 kph), and the National Hurricane Center said the system should continue moving in this general direction at a slower rate of forward speed during the next two days. Maximum sustained winds are near 35 mph (55 kph) with higher gusts. The estimated minimum central pressure is 1004 millibars. Some slight strengthening is expected, and the system may become a tropical storm by Wednesday, Sept.13.